Deepak is 25 years old and a resident of Kaushambi, Uttar Pradesh. He lost vision at the age of 12, due to Meningitis. It was a gradual loss of sight after the fever, when he started facing problem while studying. His teachers understood the problem and informed his parents. Initially for 2 years his parents took him to Gorakhpur and Lucknow government hospitals for eye treatment, but when doctors said that his vision cannot be restored, his parents sent him to his grandparents in Kaushambi. His parents continued to live in West Bengal with their other four children, as his father held a government job in the municipality there. Deepak is the youngest of all siblings, but his parents had no clue how to deal with his visual disability so they left him with the grandparents. They did not know how else to support him except taking care of him financially. For the past 12 years, Deepak has been living a life entirely dependent on his grandparents due to lack of awareness. Five months ago he heard about the Eyeway toll-free number on Vivid Bharti (radio) and decided to call the Helpdesk, seeking support and guidance. Deepak was curious to know if it was possible for him to lead an independent life, earning on his own despite his vision loss. The counselor had to counsel Deepak to re-start his education, at the age of 25. Deepak was advised to enrol in NIOS and give exams for Class Xth, which will enable him to study further as he is interested in Science. 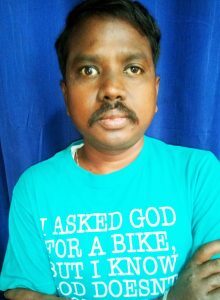 The counselor also realized that Deepak has lived a confined life so he needs to be oriented into a life with blindness for which we suggested him to enroll in a course at the Blind Relief Association (BRA). The course would equip with skills in mobility and computers. Once he is rehabilitated, he will have better knowledge of using assistive technology which will help him in pursuing his education. Our counselor briefed him with all the documents required for the admission in BRA course as he will be joining the session from January 2019.